Totally unrelated to this recipe but I just have to share. I've been trying to post this for the past 2 hours and nothing was happening. Just this blank screen situation and then this bizarre error message. This is..umm, let me think... maybe the 50th time I've run into this issue. Normally, this causes me to get in a tizzy and convince myself it's time to make the switch to Wordpress. Yet, here I am again having the same problem. This time I'm making the switch. No more of this nonsense..
Three months from now, ask me if I'm still using blogger. The answer will probably be yes.. You see, there's this illness that has affected me all me life. It's called Procrastination..
More like two cups of vodka and the fact that you can NOT freeze those 2 cups of Vodka in Popsicle molds. It doesn't matter if you already know this. Frequently, determination gets in the way of knowing and leaves you with 12 molds full of fruit soaked Vodka.. No, it's not frozen and never would of frozen in the first place. I believe this is know as science or better yet common sense. Unfortunately, I never did that great in the former and don't always make best use of the latter. How many times did I try to pour.. 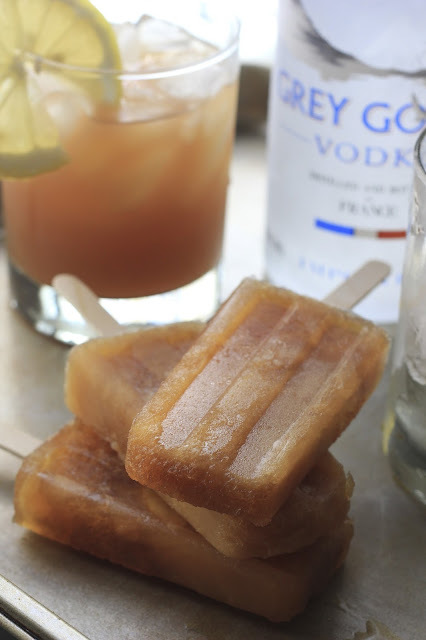 I don't know...2 cups of vodka in Popsicle molds. My husband just laughed at my futile attempts to defy science. But I was determined and luckily what will not freeze... can be drunk..straight outta of the molds. Or blended and served in a glass... all lady like. In my duration as a mad scientist, I created quite a few not freezable concoctions. Which resulted in bits of hysterical laughter and my husband telling me to call it a day. Not before I made a wonderful discovery. Two cups of vodka won't freeze..no.. but 1/4 of a cup of vodka mixed with a little lemon juice, sweet tea and sugar mostly certainly will. It just won't give you that too groovy feeling 2 cups does..
2 Tea Bags- Lipton, Tetley or even store brand will do. Once the tea has steeped add lemon juice and vodka and stir to combine. Add thin lemon slices to each mold (optional) then pour tea mixture it to each mold. Place molds in freezer and allow to freeze for about an hour. 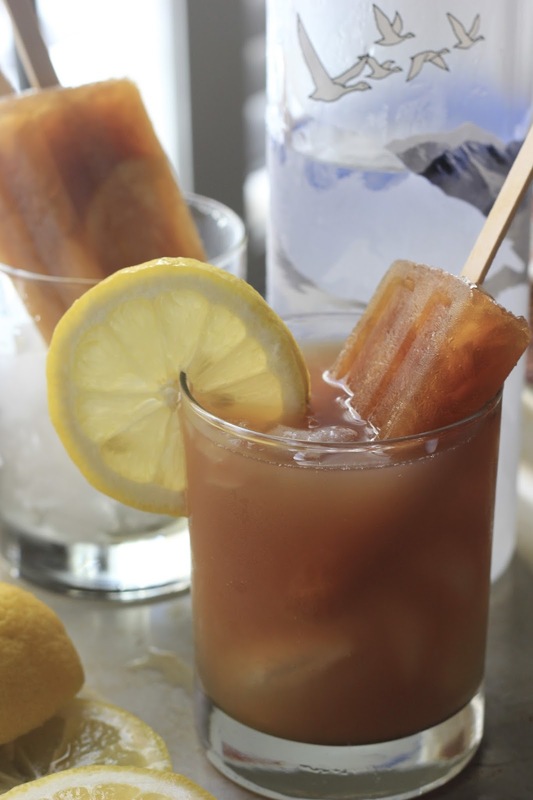 Add sticks through the center of each Popsicle mold. Allow to freeze overnight. That alcohol doesn't like to freeze, so it needs more time. Unless you've got some Liquid Nitrogen.